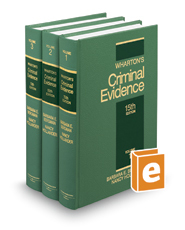 Wharton's Criminal Evidence thoroughly analyzes applicable Federal Rules of Evidence and cases interpreting the rules. Expert authors compare and contrast corresponding evidentiary rules, statutes, and individual state cases. All evidence and admissibility principles are treated specifically as they apply to criminal cases. This title contains expert guidance for both defense and prosecution on handling witnesses, impeachment rules, lay witness opinion, expert testimony, and real and demonstrative evidence.